Cheap flights from the UK to San Juan, Puerto Rico from £336 roundtrip! Cheap flights from Bucharest to Panama City already for €363! Cheap flights from main airports in Germany to Brazil (Belém, Natal, Fortaleza, Salvador da Bahia) from €350! *HIGH SEASON* Cheap flights from the UK to San Juan, Puerto Rico from £336 roundtrip! Deal with Delta and Virgin Atlantic is valid when departing from the UK to Puerto Rico in January and February 2020. A bit more expensive also in November and first half of December 2019. Min stay 7 days or return flight commences on Sunday. Max stay 12 months. No stopover available. No bag in hold in base fare. Fare class Feeder / Intercontinental leg is “T“. Discount is available till 9th of May or until sold out..
We recommend you firstly compare the cheapest flights via Google Flights (Guide). Works for Air France deal only. The tool gives you almost instant result and you can easily browse throughout all the months. You can then book this deal directly with Delta or Virgin Atlantic or your preferred booking agent. If interested in this offer you can refer to our booking samples below. Edinburgh – Puerto Rico from £352 (Choose an option based on direct booking with Delta then proceed to airline´s website. The price will fall in next step). You can book your accommodation in San Juan, Puerto Rico via Booking.com. Also you can further discount your hotel when using one of following promo codes. 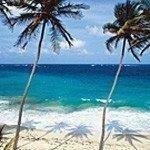 Booking sample of cheap flights from the UK to San Juan, Puerto Rico from £336 roundtrip! In this case you would depart from Manchester to this Caribbean destination on Friday, 17th of January. Inbound from Puerto Rico back to the United Kingdom would be two weeks later, on 31st of January 2020.